One hundred and thirty five Generation Hire & Sale customers and guests came to watch Edinburgh play Montpellier in the Heineken Champions Cup. The guests braved a cold Murrayfield Stadium night to watch the winner takes all final Pool 5 game; the loser not proceeding to the play-off stages of Europe’s premier rugby competition. 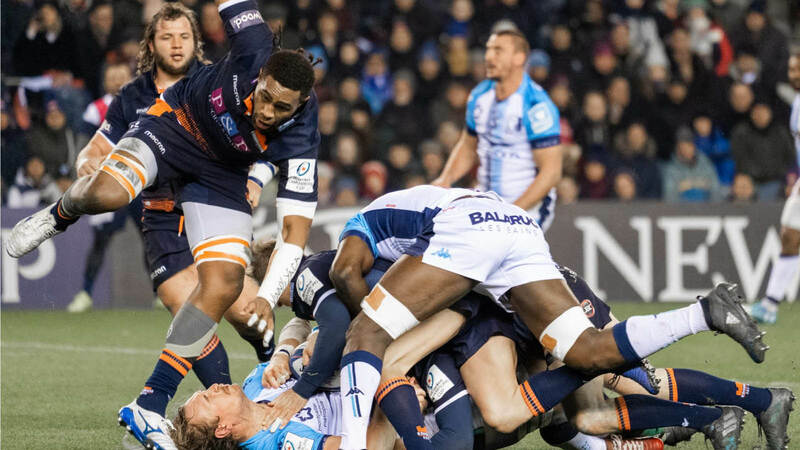 Although, Altrad sponsored, Montpellier took the lead shortly after half-time they were unable to stem Edinburgh’s possession and lost 19-10. The win was a reversal of the October game which was won by Montpellier 21-15. The result meant that Edinburgh topped the group to reach the quarter finals of the competition for the first time since 2012. After the game, the Montpellier players put aside the disappointment of losing to mix and talk to our guests; where they presented a signed Montpellier shirt to Keith Copland from Babcock International who accurately predicted the total number of match points. Generation’s relationship and involvement in rugby has been driven by the common values of: respect, solidarity, team spirit, commitment, courage, selflessness and humility. The sponsorship of Montpellier provides a focal point with European games to bring people together and demonstrate those values in practice.